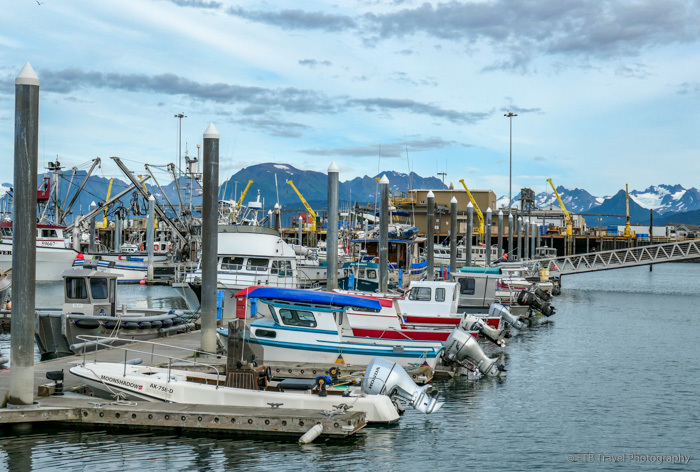 After a day of crummy salmon fishing in Cooper Landing (try trout fishing on the upper Kenai instead), I planned a leisurely day of driving from Cooper Landing to Homer with scenic stops along the way. Very close to Cooper Landing is the East entrance to Skilak Lake Road, an 18-mile gravel road which travels through Kenai National Wildlife Refuge. Several trailheads initiate off this road including Skilak Lookout Trail. The path was a short four-miles and came recommended, so I decided to try it out on a welcomed sunny day. I should have paid closer attention to the wooden walking sticks and shoe scraper at the trailhead sign as this was a precursor to how my next two hours would be. I followed the path through a moist forest home to many mushrooms. It didn’t take long before I was dodging mud puddles as I engaged in balancing acts while stepping from log to log. Trying to escape the mud turned into an exercise in futility as I slid along the trail whose steepness increased significantly as I approached the summit. I truly wished I had my hiking pole with me as I grabbed hold of chest high grasses for support. These tall, dew covered grasses draped over the path. Without wearing rain gear, I soon found myself wetter on this sunny day than in the rain as my pants soaked in the water off the plants. After a week of rain, being wet on a dry day soured my mood. I wondered to myself why anyone would like or for that matter hike this trail. Soon, however, I was rewarded with fantastic views of Skilak Lake, the lower portion of the Kenai River, and the Kenai Mountains. I dried out just a little as I enjoyed a snack on the mountainside before returning to the car where I rung out my socks and resorted to a complete change of clothes. Hiking boots and poles, both of which I didn’t have with me, are must for this hike! After my hike, I continued driving the scenic 18-mile Skilak Road in hopes of seeing wildlife, but it was primarily surrounded by dense forest. From Skilak Road, I continued to Soldotna and stopped at the Kenai National Wildlife Refuge for some tips on where to spot wildlife as I was reluctant to venture on anymore trails. The ranger suggested I take a drive down Marathon Road near Kenai Municipal Airport. While I didn’t spot any moose, I did see my first and only caribou! Not to mention, the road, which runs mostly through prairie, offered lovely views of snow-capped volcanoes in the distance. Russian fur traders settled this small fishing village in 1820. Now it is home to a handful of wood homes, a gift shop and a Russian Orthodox Church with a cemetery which tops the hillside. A path behind the gift shop leads visitors to the church. A rough road leads drivers past the small fishing harbor to an expansive beach that provides unobstructed views of the volcanoes across the bay. The Alaska.org website suggests to stop at the Scenic View RV Park for a nice view, but the RV Park has a sign posted forbidding this. Of course, there are some other scenic pullouts for obstructed views, but I think Old Ninilchik Village is the best option for a good view. The Homer Spit is a long, narrow finger of land which juts 4.5 miles into Kachemak Bay. The spit is dotted with tour businesses, retail, restaurants, RV’s, boats and beaches. Browsing the shops and walking in the boat harbor is a treat. WANT TO TAKE THIS POST WITH YOU? Click HERE to download it with the GPSMyCity Travel App for an offline GPS guided article. Next Post Alaskan Coastal Brown Bears…UNBELIEVABLE!! !